Pat, the only reason Boesch is in RF is because DY is even worst in the field. Therefore for Boesch to have value he has to hit 270 and hit 15 to 20 homers. I hope Tigers keep Q Berry for his D. Tigers would have great D in the outfield with Jackson and Berry in our spacious ballpark. Kelly is good too as a defensive replacement. If the Tigers played in a park like Fenway or Yanks stadium then you could place no range fielders in the field. JP is the Tigers ss because we can hit. if he is not hitting than he has no value. Raburn War value was -1.4 and exactly same value has Boesch. 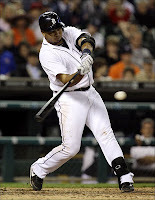 Tigers need to make a trade for a ss or 2B and reliever. Trade any prospect that not name Castellanos or Rondon. The real #1 and #2 here are Scherzer and Porcello. If either of those two took a big step forward that could be a big difference maker for the Tigers. Peralta and Young are what they are. What they're giving us is pretty much in line with their career averages.